According to the latest research from Strategy Analytics, global smartwatch shipments grew 223 percent annually to reach 4.2 million units in the first quarter of 2016. Apple captured 52 percent global smartwatch marketshare, dipping from 63 percent share in the prior quarter. MacDailyNews Take: 600,000 bought a Samsung stupidwatch with Apple Watch in the market? We had no idea there were so many head injury victims wandering around out there. Of course, these numbers are just guesstimates as Apple does not release Apple Watch unit sales figures for competitive reasons. 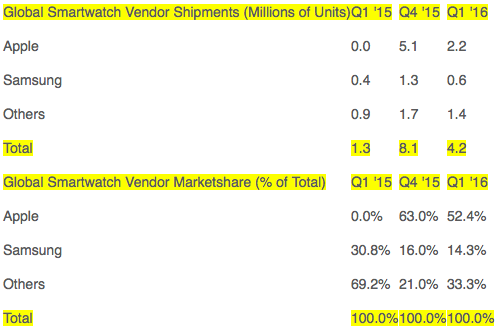 Apple Watch unit sales met our expectations in the quarter. For some color on how we think about Apple Watch sales, we expect its seasonality to be similar to the historical seasonality of iPod, which typically generated 40% or more of its annual unit sell-through in the December quarter. We started shipping Apple Watch just one year ago, and it has quickly become the best-selling and most loved smartwatch in the world. In fact, unit sales of Apple Watch during its first year exceeded sales of iPhone in its first year. I hate these headlines. Naturally, Apple leads others out of the gate and garners the majority of the market share. As others begin to encroach it’s understandable that Apple’s share will slip. This inevitably leads to crazy headlines. Furthermore, as others enter the market, their minuscule share growth rates appear disproportionately large compared to Apple, leading to misleading headlines such as “Samsung smart watch grows at twice the rate of Apple Watch!”. I agree. These numbers are little better than guesses, since no one announces actual sales. What’s particularly annoying is how they include what to count, so that 33% are simply Others. I doubt that very many of the so called competition are anywhere near as capable as the Apple Watch. When you make numbers up, and mash in undeserving “competitors”, it’s pretty easy to say Apple’s share is declining. IDC’s been doing this for years, most recently creating a category of Wearables throwing in Fitbit exercise bands just to denigrate Apple’s contribution to smart watches. Since Apple refuses to reveal sales data how the f*ck can you say these reports are false? What do you know that the rest of the world’s inhabitants are unaware? Why don’t you publish actual sales data of all Apple products or simply admit you are just another ignorant Apple fanboy? You already own the market on world beating ignorance. The good news just keeps on coming. Tim Cook is on a roll. Just more blatant Apple Hater vitriol. You have zero credibility here. Criticizing Apple leadership is needed because Apple leadership us failing. If you can’t understand the difference ask an adult to explain it to you. You offer nothing to the equation besides simplistic idiocies on the speaking level of movie Tarzan’s. Understand THAT, but of course you don’t. Funny you use the word adult, a status you have yet to achieve and are never likely to. Well, that news oughta knock a couple more bucks off the share price tomorrow. Friday capitulation. What other company like Ford, BMW, Honda, … would die to have 52% of a market on the 1st or 2nd year of a new product. Nothing is ever good enough for Wall Street. And Tim Cook and the board, why did you not buy TiVo? Could have migrated the design into the AppleTV and the Mac mini? Would have gotten around many speed bumps in front of the home TV market!